After nine long months, your bundle of joy has finally arrived, but unlike a traditional birth, your baby was born via c-section. Abdominal surgery is painful, and it is going to take a while to recover. You will not bound back to your pre-pregnancy weight and form as quickly because your body needs time to heal. Losing weight after pregnancy is hard, but it is even more difficult following a cesarean birth. Undergoing a c-section birth is far more complicated than a traditional delivery. Your body requires a post-operative recovery so you should not immediately focus on how to reduce your tummy after c-section. It is going to take time for your body to heal both inside and out. You must wait for your physician to remove the stitches or staples before you can even consider cardio or weight-lifting exercises. Many women are discouraged with the appearance of their stomach after surgery because they have a very noticeable pooch. Tummy reduction is not easy because the skin and abdominal muscles were severed with the incision and will take time to reconnect. However, one trick on how to reduce your tummy after a c-section is simply to eat healthy. Your body is going to require nutritious foods to promote recovery, produce nutritious milk for your newborn, and burn unwanted belly fat that accumulated during the last nine months. There are home remedies to reduce your tummy after c-section. Many of the remedies have been used for centuries to lose unwanted baby belly fat. Yes, weight loss after a cesarean section is often more difficult, but if you focus on keeping your body healthy then you will eventually regain your pre-pregnancy form. Breastfeeding: Breastfeeding burns calories. Your body requires an additional 400 to 500 calories to help keep your milk production flowing. If you do not increase your caloric consumption to meet your body’s needs, then your body will burn unwanted fat to meet your caloric requirements for breastfeeding. Breastfeeding has always been one of the most classic home remedies to reduce weight on the tummy and hips. Massage: During pregnancy, your body’s lymphatic system stores fluid which can give you a puffy appearance. The body naturally starts reabsorbing the fluid after delivery. However, you can focus on massage to quickly break up the fluid for rapid absorption. Massage the back, hands, and legs. However, abstain from abdominal massage until at least four weeks post-deliver to give your incision time to build scar tissue. Drink Lots of Water: Hydrating is one of the best home remedies to reduce weight in tummy and hips. Drinking lots of water maintains your body’s fluid balance but also encourages the fat to start melting away, especially around your waist. If you do not remain hydrated, your body can start to hoard water and give you a bloated appearance. Having a post c-section belly is discouraging if you once had a flat tummy. However, following any major abdominal surgery, the pooch that remains is usually not just fat. There is swelling with fluid accumulation. In addition, the uterus takes time to shrink back to its normal pre-pregnancy size. Also, the abdominal muscles have been severed so they must heal before they can again retighten. Sure, there might be some weight loss after a cesarean section required to gain the body you once had, but overall, it is a combination of factors that contribute to your post c-section belly. Your belly after birth via c-section is going to be physically different than if you had undergone a traditional birth. During a c-section the surgeon cuts through some of your stomach muscles which makes a pouch of fat on your tummy that is often more noticeable then it was pre-c-section. The incision causes stress in abdominal muscles and your pelvic floor. It is imperative that you wait at least six to eight weeks before you start working on your belly after birth. Your body and postpartum stomach are going to need time to heal before you undergo any aggressive exercises. If you are wondering how to lose weight after a cesarean section if you cannot pursue any aggressive forms of exercise the answer is simple: start walking. Walking is a gentle impact exercise that effectively burns unwanted calories but does not over stress your incision. Just by walking three or four times a week, your belly after birth will start to shrink and flatten. You can load your baby into a stroller for a walk or simply purchase a treadmill to stride in the comfort of your own home. Tummy binding your belly after pregnancy gives you a better range of motion when sitting and standing up so that you do not experience pain from your incision. The binding applies just enough pressure to take away any discomfort. Binding your belly after birth alleviates pain and promotes the development of a flatter stomach after c-section surgery. The cloth wrap will assist blood flow and helps your posture. By allowing you to comfortably stand straight and sit upright, your stomach muscles start to again regain strength and your belly after pregnancy takes on a more concave appearance. 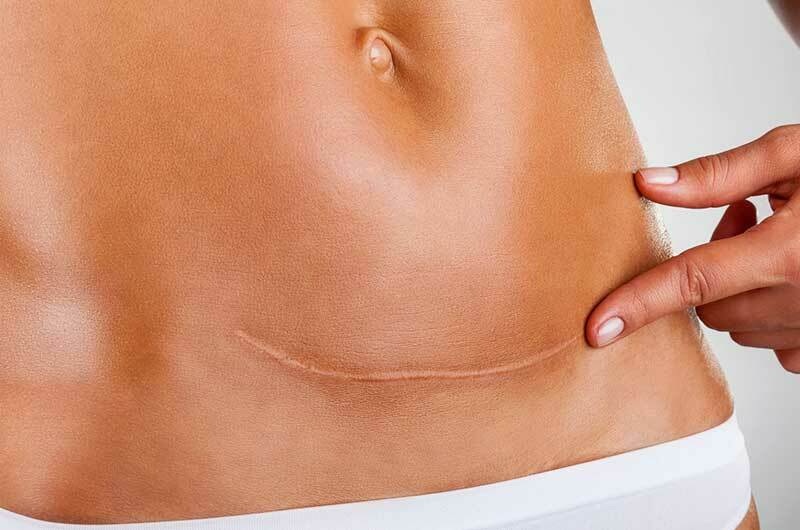 Undoubtedly, your stomach after c-section surgery will thank you for using a binding to reduce discomfort. If you are faced with the dilemma of how to get rid of a hanging belly after a c section, then you might want to explore mild forms of yoga to create a flatter tummy fast. Yoga tones and strengthens the stomach muscles gently. However, before you start any yoga class be sure you wait at least six to eight weeks to exercise after a c section to reduce tummy weight. Also, you should always consult with your physician before starting any new exercise or training program. However, if you have the green light to practice yoga then you will want to find a yoga instructor that specializes in women seeking to lose their pregnancy belly after a c-section. Normally, you will begin yoga exercise after a c section to reduce tummy weight with simple breathing exercises that put you in touch with your body. They do not overtax your system. In addition, breathing exercises also help reduce the stress that a new mother often experiences after major surgery and then having to deal with taking care of a newborn. Stress reduction through breathing control lets you focus on you and your body’s internal needs. This is really the first step towards how to lose your pregnancy belly and attain a slimmer and healthier you. Whether you had a cesarean or traditional birth, you still must exercise to lose your belly. However, following a c-section, exercise will just be postponed a few additional weeks. Once your physician has given the ‘go ahead’ and you feel like your stomach incision has healed up sufficiently it is time to exercise. Remember, to start out slow and do not overdo it. Here are a few exercises that you can perform to tighten your stomach after a cesarean. The Bridge: The Bridge focuses on working your core muscles and your glutes. However, it does not put any strain on your incision. Lay flat on a solid surface with your feet flat on the floor. Position your legs so they are apart at hip-width. Place your arms next to you at your sides on the ground with your palms flat against the ground. Use your abdominal muscles to slightly lift your buttocks, then your stomach, and finally the middle of your back from the floor. Your body will form a bridge. Remember to keep your shoulders flat on the ground. Hold the bridge position for ten seconds. Repeat this exercise six to eight times (or however many times you can). Pelvic Tilts: The pelvic tilt is like the bridge, but you tilt your hips upward only using your stomach muscles. You do not lift the rest of your body from the floor’s surface. In addition, you can also do this exercise when you are standing up against a flat surface such as a wall. You simply contract your stomach muscles so that your hips start to tilt forward. Perform at least a dozen pelvic tilts daily to tighten your core muscles. Water Exercises: Swimming burns extra calories without placing any type of hard strain on your body. Also, the action of swimming helps strengthen your muscles without overdoing it. Forward Bends: You must stand straight and then slowly bend forward while holding your arms straight out before you. Your head will be level with your waist. Hold this position for up to ten seconds and then straightens your entire body. Repeat this exercise four to five times to strengthen your middle and lower back. Kegels: After a c section, your pelvic floor muscles will be loose. Part of toning your stomach involves tightening your pelvic floor muscles performing classic Kegels. If you are wondering how to perform Kegels, then simply stop the flow of urine while you are urinating. The muscles used to stop the urine are your pelvic floor muscles and the effort undertaken to halt the urine’s flow is a Kegel exercise. You can perform Kegels without urinating but by simply repeating the same internal process. You should perform Kegels in repetitions of four to five times in a row and then take a 10-second break between each set. If you need the motivation to work out and lose your post-baby tummy flab then why not enroll in a yoga class or employ a personal trainer to give you the encouragement that you need. You could even investigate ‘mommy groups,’ which are other new mothers who go walking with their infants daily to also fight the belly bulge and lose the unwanted baby fat. Sometimes having the companionship of other moms who are also coping with their physical changes feels good. You can share tips and encouragement needed to push your body daily. Breastfeed your baby to use excess calories. Walk daily. You can even push your newborn in a stroller and soak up some fresh air together while you exercise with a slow and steady walk. Bind your tummy using one of the many post-delivery girdles or bell bands. Exercise as soon as your doctor says it is safe. Remember, the process of recovery after a cesarean section is slow and you will not immediately bounce back. Your body needs time to heal so you will have to practice patience. However, you can get rid of your c-section tummy with a bit of dedication and exercise.